Sailboat Sales Co. was founded in the mid 1960's and has been in continuous operation ever since. The present management team, headed by Bruce Rosenzweig, began full-time operation in 1974, working out of AAA Marina on Chicago's near north side. 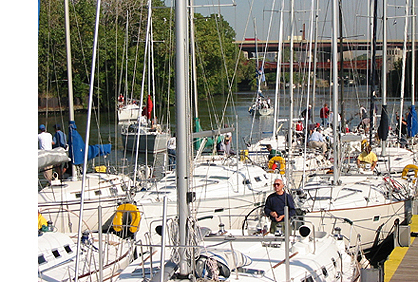 In the summer of 1978, the staff of Sailboat Sales teamed up with widely respected sailmaker Grant Crowley and purchased seven riverfront acres on the city's near southwest side. 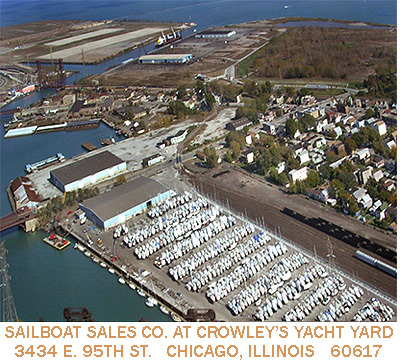 At the very beginning, Crowley's Yacht Yard stored and serviced over 250 sailboats. At that time, Sailboat Sales Co. was a major dealer for Florida-based Irwin Yachts, Hunter Marine, Morgan Yachts, and the Texas-built Petersen 34 racer/cruiser. Shortly thereafter, the new and popular J-Boat line was added, quickly followed by the world class Maine-built Sabre Yachts. The Canadian Nonsuch catboats came next. In 1993, we became proud representatives of the revolutionary line of Freedom Yachts, followed a year later by the line of traditional Island Packet cruising yachts. Sailboat Sales Co. went on to represent the finest American-built sailboats available such as Island Packet Yachts and the Carroll Marine-built Farr designed Mumm 30. Sailboat Sales Co. continues to represent a wide variety of pre-owned brokerage boats, with a large selection right here at Crowley's. Over time, the storage and full service operation at Crowley's grew to thirteen acres servicing over 650 boats. In 2004, Crowley's finally outgrew the Corbett Street location, and 2005 marked the first year in our new location at 95th Street and Ewing Avenue, a short river trip from Chicago's Calumet Harbor. Read an article called Crowley's: Rehab for Raceboats from the May 2009 issue of Sailing World magazine. Our staff is comprised solely of experienced sailors with a wide variety of talents, ranging from racing to cruising and everything in between. Few firms have as much on-the-water and technical experience as Sailboat Sales Co.